Tierra Thomas said he was humiliated by what a lifeguard at an Ohio public pool said to keep him from getting in the water. "I've gone there my entire life. Since I was a little girl," Thomas said. But Thomas isn't a little girl anymore. In fact, the 26-year-old has spent the last six months transitioning from female to male. A move that may have muddied the waters at the Tuscora Park pool in New Philadelphia. Thomas said he was at the pool with his wife and 2-year-old son a few weeks ago wearing what he normally wears: a swim sports bra and swim trunks. But, Thomas said, a lifeguard stopped him just before he jumped in and told him he couldn't get in because he wasn't wearing "proper female swimming attire." "She could have pulled me to the side and explained it to me," He said. "She didn't have to single me out in front of everybody. It's humiliating." Thomas was eventually allowed to swim and spent the rest of the day there with his family. 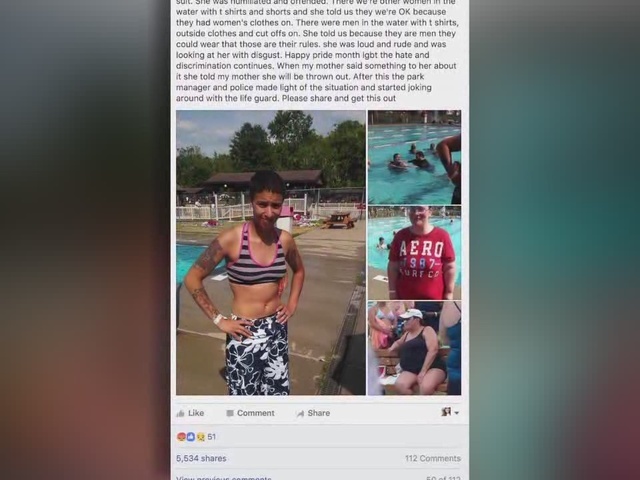 His sister snapped a photo of what Thomas was wearing — along with what other people were wearing in the pool — and posted about the possible discrimination on Facebook . The post was quickly shared more than 5,000 times and by the time it reached city leaders, they knew something had to be done. "I think it got posted and people's reaction was the same as ours. If someone is being discriminated against, it is intolerable. We have a zero tolerance policy for discrimination," said Marvin Fete, New Philadelphia's law director. Fete said they put the lifeguard, a senior staff member that trains other lifeguards, on paid administrative leave while they launched a full investigation. But after interviewing eyewitnesses, Fete said that he doesn't believe it was purposeful discrimination. It was simply enforcing the rules, posted on signs at the pool that read "swimsuits only." "I don't think the fact that this person was transgender played any role in this at all. I think it was purely, you can't go swimming with a sports bra on. That's the policy," Fete said. Thomas plans to file a formal complaint against the city and will be meeting with the law director before the investigation wraps up. It is not yet clear if the lifeguard will be further disciplined. Fete said he will be recommending that lifeguards are no longer in charge of policing what people wear at the pool. New Philadelphia is located about 90 miles south of Cleveland.